Before I start the actual review let me tell you, Miss Ryals has impressed me greatly. Normally I am wary of any book that gets a lot of good ratings. But in this case I can see that it was deserved. Dayton's parent die in a car accident when she is 10. Dayton and her sister Amber are sent to live with their Aunt. Her Aunt is an Abbess. Something is weird with her Aunt and the Abbey where she lives. On her seventeenth birthday Dayton is ambushed by her Aunt and the Sisters of the Abbey. Turns out that they are a sort of Cult. Her aunt binds Dayton to a Demon (Marcas) because she believes that it will help her Order win "the war" . And THAT is where the whole mess (and the actual plot) begins. 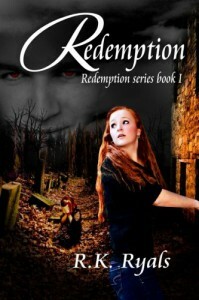 Redemptions is a breath of fresh air in Paranormal genre. There are a lot of books out there that are based on Angels, Demons and Nephilims but Redemption is still able to carve its own place because its different . I loved that Miss Ryals explains everything, even the small details you didn't know you wanted to know about. Dayton is a strong character and entirely loveable. She is not a doormat for anyone *wiping my happy tears*.She is relatable . Her feelings are understandable. You can understand why she feels what she feels . Her every feeling ,be it anger, guilt, dislike for her sister or her hatred, is justified by her situation. Dayton is a nice blend of sassy and sweet. You cannot dislike her. The side characters are not best-friends-left-in-the-dark. They have their own strengths and abilities. Monroe is the kind of best friend everyone wants. Connor is the resident cute flirt. There is a hint of love triangle but its not a central part of the story. What I liked about Dayton was that she was not confused about her own emotions. Connor loves her. Dayton knows that she loves Connor but not in that way and does not string him along. Marcas is the Demon Dayton is bound to. Another best part of the book; in the middle of the war you will not find Dayton oogling at Marcas' handsome body. There was NO insta love going on here. Other authors please note that that is the rational way to behave under such circumstances . She is not immune to his good looks but Day is not focused on it day and night. There were some minor problems that I had with Redemption. First of all it takes nearly 35% of the book to get things started. I liked the part where Dayton comes into her power but I would have liked the fight in the end to be a bit more...epic, I guess? Lastly I would have preferred a bit more romance between Marcas and Dayton. Overall the book was really good and thoroughly deserved the 4 stars.